You'll be £9.59 closer to your next £10.00 credit when you purchase De Havilland Comet. What's this? The world got a little smaller in July 1949 when the first jet-powered airliner took to the skies barely four years after the end of the Second World War. 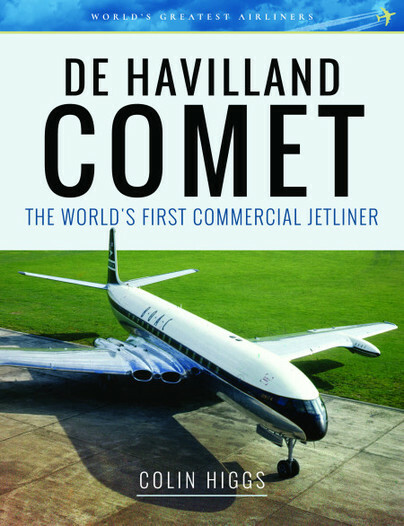 Not only was the de Havilland Comet 1 was a lot faster than previous airliners, it could fly higher and further. It was packed with new technology but, perhaps most importantly for those early passengers, it was a quiet, luxurious and even pleasant experience, something that could never be said for the noisy piston-engine aircraft that came before. The Comet’s leadership in jet travel for the future was assured until aircraft began crashing. The first ones were put down to pilot error but two disastrous events in 1954 grounded the fleet and Britain’s advantage over the rest of the world was lost. Boeing caught up with its ubiquitous 707 and the Comet was destined to become but a memory. However, rising from the ashes came a new Comet – one that was bigger and more powerful than before and designed for completely different roles. Where the first Comets had provided an expensive and plush way to travel for the rich few, the new Comet 4s carried more passengers to a multitude of destinations inevitably becoming key carriers for the early package holidaymakers. At the same time they became vital strategic transports for the RAF as the British Empire receded. This book tells the full story of the world’s first jet-powered airliner, from its remarkable beginnings, through its early flight trials programme to its entry into service. The type’s military career is also covered, as is its construction; also included in this volume are details of the numerous variants produced and those still surviving as exhibits today. A good account of the service life of the Comet, including a long section on use by the RAF, including clandestine operations. he author tells this story simply and effectively in a straightforward chronological narrative. A final chapter, The Comet Experience, is based on the recollections of two RAF pilots and an Appendix gives the full production list. I enjoyed this book and would highly recommend it. The reader gains a unique insight into the operations and important events, as well as the daily life of Comets throughout the entire history of the type, from its first flight in July 1949 till its last in 1997. The quality of the book and pages is excellent, as with others in the series, and this would make a great addition to any aviation enthusiast’s bookshelf. It’s key benefit is in exploring and explaining the history of this type in a compact and easy-to-read way.